Sohrab was born in Tehran in 1984. He was seven when the Iran-Iraq war ended. His name, from an old poem called ‘Shahname’, means ‘rouge water’, which can also mean ‘blood’. He started a punk band with his brother and a friend, which lasted about two years before splitting. Sohrab is totally isolated in Iran, with little or no connection to what is happening there. Sohrab is, like so many, displaced within his own country and occupies a similar internal cultural isolation. This is suggested by Jon Wozencroft’s imagery and artwork; looking in through shattered glass and an air of menace underneath the surface. Sohrab used Reason 3, his midi controller (R)evolution UC-16 and a sampler, recorded live through Ambrosia recording software. Utilizing what are now staples of electronic music (Reason 3, MIDI controller and sampler) Tehran-based Sohrab presents a slab of shifting, groove influenced, ambient soundscapes. The album A Hidden Place comfortably posits itself into the necromantic compositional field of pop influenced computer music. Sound characteristics typify a vibe of isolation, yet don’t seem to yearn too much for company. The first piece “Susana” is the most danceable through the use of repetitive pulse in common time, yet there is no distinctive melody that would assimilate shaking hips. Instead the rhythm is mirrored through gurgling samples and shifting synth-scape material that sweeps through various filters in step with the pulse of the piece. Intensity rises through out the duration of the piece by rising volume of a swirling, ethereal chord which begins to modulate in 3rds and 5ths as the rhythm takes a back seat volumetricly, otherwise there is a serene stasis to the piece. Each side of the record contains three pieces that blend rather seamlessly, which makes it difficult to differentiate between the tracks. This is of little concern however, as the overall movement and sonic images provided remain intact and complete. Some pieces include more than the standard IDM palette, making the most of samples such as voices – both spoken and singing – as well as environmental sounds. My favorite would have to be the inclusion of a rooster crowing and clucking which, ostensibly remains unaltered against the electroacoustic tones carrying the piece. Utilizing just field recordings, software, and live mixing, A Hidden Place is a dynamic album despite its sparse nature. “Susanna” hides grimy, treated percussive loops below time worn hums and reverberations, burying what would otherwise be boisterous sounds in blankets of quiet. The rhythms take on a flanged, aquatic character as icy melodies rise to the surface to become the focus. “Somebody” also uses sparse, treated field recordings that sound as if they were collected in secret, with what sounds like distant prayer chants clearly setting the mood in which this was recorded. Voices appear, somewhat overtly, towards the middle of the piece, conveying a feeling of being questioned by some draconian authority. “Pedagogicheskaya Poema” demonstrates this at its most jarring, with subtle, simple sounds constructed into beautiful micromelodies, creating a hypnotic swell that is violently interrupted by a squealing blast of noise, making the implied tension overt. Organ like bells open “Himmel Uber Tehran” above a rhythmic backdrop of reversed static bursts and clear, digital chimes that take command, once again providing a warm, inviting glow. This is snuffed in the title track as layers of oppressive, but brittle noise cover everything, with the occasional snapping or crackling outburst to be heard. Just as the noise retreats, yelled voices appear, again making the underlying tension tangible. As the B side ends on “Zarrin,” there is a sense of relief that the remaining treated and stretched melodies give. Under a layer of heavy vinyl surface noise, the melodies twist and curve into one another without any harsh outbursts. The pensive, melancholy tones sound like they’re coming off an old LP that has been passed around in secrecy for years. With this album, context is everything and nothing. Sohrab is a Tehran based musician whose sense of displacement and isolation within his own country is palpable across the six Ambient pieces making up this release. He’s both a product of his environment and a reaction against it. This contradiction still fits a model of rebel music (punk, say), except that here the form of expression is so internalised as to represent a kind of withdrawal. There’s plenty of space in his soundscapes, where the slow reverb of chimes and the fluttering of abstract electronica punctuate solemn pauses. It’s like an expression of emptiness, of faint, spectral essences occupying vacant areas. But then these spaces become filled with a more forthright presence of undulating tonal frequencies, a respite from the indefinable sense of oppression. This is the first thing I’ve heard from this young Iranian artist and as far as I’m aware his first physical release finding a suitable home at camp Touch. Sohrab creates unique soundscapes using Reason software with superb results. From the slowly building evocative bubbles of ‘Susanna’ to the emotionally resonant ‘Somebody’. Sohrab also uses field recordings adding an additional layer of depth to his sound world. The tracks work subtly and build a mysterious picture of hidden corners. Fine quality stuff. Which hangs uncertain to which side to fall. Only the event will teach us in its hour. The Shahnameh (Tales Of Kings) is the poem by Ferdowski from around 1000AD which interweaves the history and myths of Greater Iran in its 60,000 verses. One section of the epic poem is devoted to the tragedy of Rostam and Sohrab, in which a young warrior of mixed Tartar/Persian descent goes into battle against the Persians. He ultimately comes up against his own father, who does not recognise him as his own, and who mortally wounds him with a spear. It is a tale which has obvious attractions for the displaced, the unwanted, those who do not belong. It was turned into an opera by Loris Tjeknavorian, a man who was born in Armenia, and who spent his formative years in Iran, but then exited pre-Revolution to live in Austria and the US. The latest artist signed to Touch is a twenty-six year old unquiet heart from Tehran named Sohrab, after the character from Ferdowski’s poem. Touch say that he “like so many, is displaced within his own country and occupies a similar internal cultural isolation”. 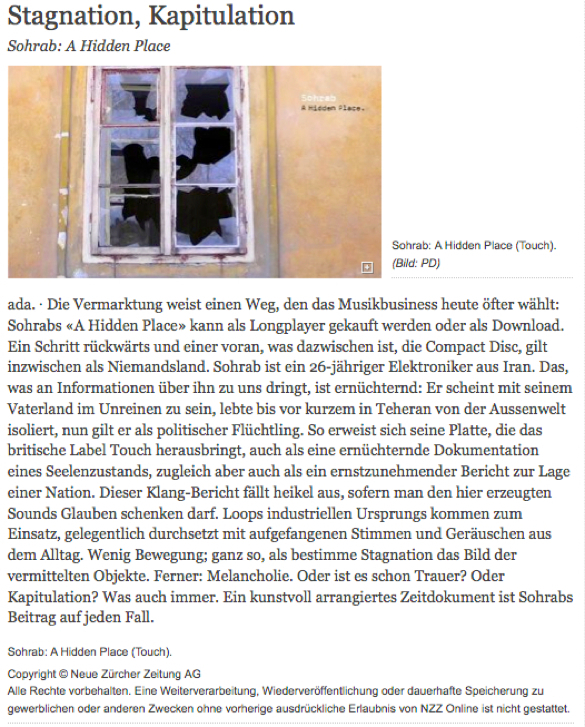 The intolerance of musical performance in Iran in particular – his only gig prior to a recent Touch-sponsored event in Berghain being broken up by the Iranian police – understandably make Sohrab feel that he does not belong there. In fact, while he managed to assemble the album there, he is no longer in Iran, having since been geographically displaced to Berlin, where he is claiming political asylum. The whole issue of Sohrab’s displacement inevitably takes on more significance when you hear his debut release A Hidden Place. 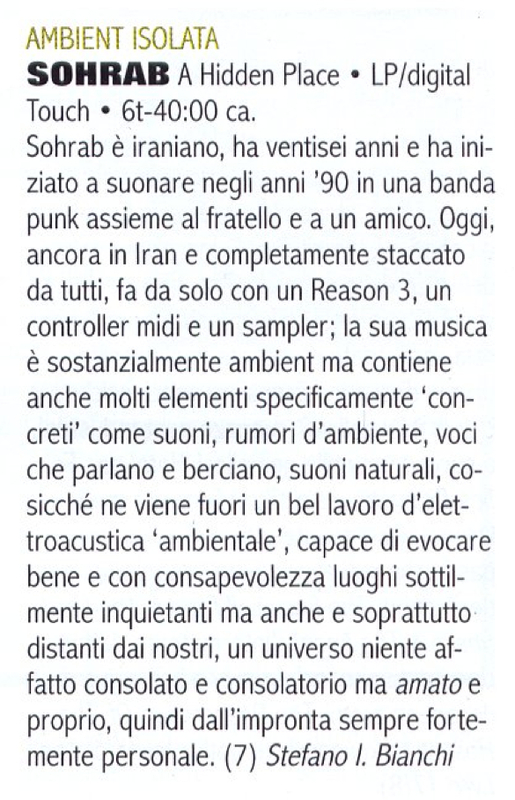 As a piece of experimental electronic music, perhaps predictably it doesn’t sound recognisably like the product of Iran. But then again it doesn’t sound much like the product of any particular culture, country or scene. One thing you can say is that it somehow manages to resemble a Touch release or, more accurately, several Touch releases. The combination of field recordings with electronic soundscapes is perhaps most reminiscent of Biosphere, at least Biosphere in Geir Jenssen’s earlier more percussion-free days. Opening track “Susanna” trickles into view like a stream over smooth pebbles, its gently ebbing rhythm gradually being carried into increasingly expansive spaces. However as the piece progresses, odd noises emerge from deep in the mix, noises which sound like garbled snatches of communications, like misfiring mobile phone reception or even glitchy cable TV reception. These feature even more prominently, along with some harsh electronic hum, on “Pedagogicheskaya Poema” a track which is texturally more like BJ Nilsen’s Invisible City, an album which sketched an unidentifiable city through its networks rather than through its inhabitants themselves. But it isn’t the rhythms or the textures which linger in the mind most: it is the moods, or rather the contrasts between the moods. A Hidden Place is at times quietly optimistic, but more often it feels pessimistic, even threatened. Around each and every neon-lit corner there is a shadow and a tangible mood of fear. The title track is a disconcertingly barren, wind-swept plain, only interrupted half way through by some yelling – perhaps excited, perhaps panicked – voices; the only time that the recognisably human intervenes on this otherwise conspicuously deserted album (the album’s artwork adds to this feeling of abandonment, with its photos of derelict buildings and empty, dark corridors). This isn’t even its most jarring moment: that belongs to the two seconds of scabrous static in the middle of the otherwise merely mildly menacing “Pedagogicheskaya Poema”, two seconds which make little sense in the context of their immediate surroundings, two seconds which feel like they have been excised and dropped in from elsewhere, a sudden and severe displacement which serves to remind the listener that nothing about where this record comes from or is going to can be taken for granted. It could be said that, as a result of all of these sudden switches in mood, A Hidden Place is slightly lacking in a sense of its own identity. But isn’t that, after all, where we came in? The album finally bleeds onto the shore, scattering birds as it does, with the melancholic, echoing chord progressions of “Zarrin”. However, it is unclear at present where Sohrab will wash up. As I write, he is spending the festive period in a refugee camp in Brandenburg. He possesses some limited freedoms, the means to communicate, and the means to continue making music. What he is not in possession of is his own destiny, his fate being in the hands of the German authorities. I hope for a peaceful ending to to this particular stanza, and that he is able to build on the considerable promise shown in A Hidden Place. Emerge, and shine upon the Aral Sea. Touch introduce a new artist to their roster, a 26 year old called Sohrab from Tehran. His startlingly beautiful first release ‘A Hidden Place’, is a six track album of elaborate ambient electronics and textured drones. Sohrab’s music is understandably informed by a life isolated from outside cultures, and even displaced in his own country, which makes his instinctively blissful yet subtly menacing music all the more remarkable. In ‘Susanna’ we glean lulling rhythms reminiscent of Biosphere’s ‘Dropsonde’ while in ‘Pedagogicheskaya Poema’ we’re reminded of BJ Nilsen and Stilluppsteypa’s ‘Space Finale’, but of course these sounds are informed by Sohrab’s own natural taste for occluded darkness. Highly recommended to fans of Deathprod, Hildur Guddnadottir, Fennesz or Kevin Drumm. Wie sehr das Geld im Zentrum unserer Kultur steht, zeigen nicht nur die in atemloser Abfolge erfolgenden politischen Entscheidungen, die nicht gerade zum Nachteil von Finanzinstitutionen, Pharmaindustrie und sonstigen mächtigen Lobbys getroffen werden. Das, was alljährlich um Weihnachten herum zelebriert wird, ist – sei man in irgendeiner Form gläubig oder nicht – allzu leicht vor allem als großes Konsumspektakel zu entlarven. Da haut man die Kohle raus, weil man sie (noch) hat, oder trotzdem man sie nicht hat. Aber man kann halt auch sagen, dass die Regierung zum Kotzen und Gott tot ist und statt in die Christmette zu gehen, eine Dub-Step-Party in Tierkostümen machen. Größter Luxus ist nun mal die (bisher/ fast) uneingeschränkte Möglichkeit der Meinungsäußerung, was auch jede Art von kultureller Ausdruckskraft beinhaltet. Diese Möglichkeiten sind in anderen Regionen nicht so selbstverständlich. Kulturell eher isoliert scheint sich Sohrab wahrzunehmen. Der 1984 in Teheran geborene Musiker war sieben Jahre alt, als der Iran-Irak-Krieg endete. Westliche Einflüsse in der Musik sind zwar heute im Iran nicht mehr verboten, die Möglichkeiten der Produktion und zu Auftritten sind aber sicher als beschränkt zu bezeichnen. Die Medienlandschaft unterliegt staatlicher Zensur. Zwei Jahre lang versuchte sich Sohrab mit seinem Bruder und einem Freund in einer Punkband. Heute ist der musikalische Ausdruck seiner kulturellen Isolation ein gänzlich anderer. Mit Hilfe überschaubarer elektronischer Mittel (Reason 3, Midi Controller und Sampler) erzeugt er klaustrophobische Klangstrukturen, die aus einem hidden place nach außen dringen. Een kapotte ruit in een ondefinieerbaar gebouw siert de voorkant van de platenhoes, een lege gang gehuld in kunstlicht de achterzijde. Als er één gevoel is dat A Hidden Place domineert, is het wel troosteloosheid. 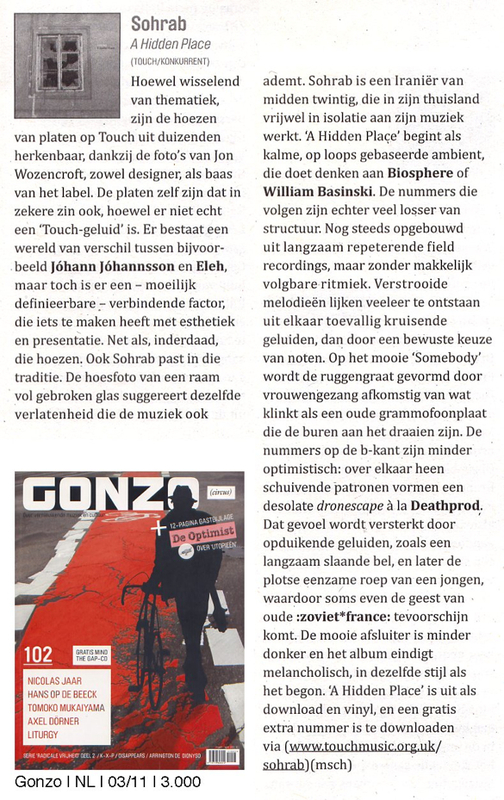 Dit geldt zowel voor het artwork als voor de muziek. Naar goede gewoonte in de wereld van het Touchlabel nam Jon Wozencroft de grafische vormgeving op zich, en als geen ander weet hij gevoelens met beelden te versterken. Sohrab, een eenpersoonsproject, wordt halverwege de jaren tachtig in Iran opgericht en groeit op in de schaduw van het conflict tussen Irak en Iran. De culturele isolatie lijkt manifest aanwezig in de muziek op dit enkel op vinyl verkrijgbare kleinood. Hoe de opnames voor A Hidden Place in Engeland terecht zijn gekomen, is niet helemaal duidelijk. Sohrab maakt met fieldrecordings, een midi-controller en elektronica abstracte soundscapes waarin soms een vleugje melodie terug te vinden is. De minimale ritmiek – op ‘Himmel über Tehran’ met klokkengelui opgebouwd – zorgt voor een rustgevend effect. Eindeloosheid en minimaal verschuivende klankpatronen dragen op hun beurt weer bij aan de algehele desolaatheid waarmee A Hidden Place doordrenkt is. I kinda hate artists whose life stories overshadow their music; if I have to understand that the main guy from Girls was a brainwashed kidnapped teenager in order to enjoy his Elvis Costello-y pop, something’s not right, you know? 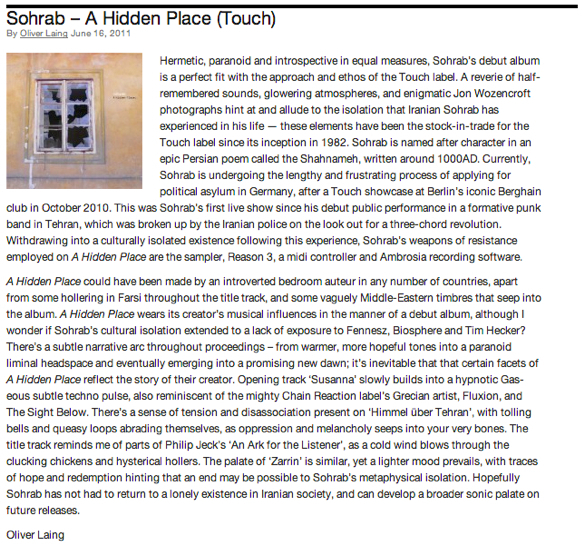 Sohrab is a twentysomething living an isolated and sad life in Iran (or so says the press sheet), and while his existence certainly factors into the sounds of A Hidden Place, it’s not crucial to the enjoyment of such. As to be expected from the Touch label, Sohrab is not a musician so much as a designer of sound, manipulating artificial electronic bubbles and lush drones alongside field recordings of village markets or wherever in Iran roosters are likely to crow. Emotions run thick on A Hidden Place – I get the impression that the source material has a deeper meaning to Sohrab than most sound artists, as if these are the familiar and foreboding tones he encounters on a daily basis, rearranged and organized in hopes of providing some sort of clarity for the listener and himself. It’s not a place I want to visit on a daily basis, but it’s evocative enough that I quickly lose myself when there. L’exil est sans doute l’une des pires souffrances du genre humain. La sensation de n’être jamais chez soi, de n’être jamais reconnu comme un des membres assimilés d’une tribu, d’une fratrie. Il ne fait nul doute que Sohrab ne connaîtra jamais la paix intérieure. Il tire son nom d’un vieux poème iranien, et il signifie « eau rouge », plus communément accepté comme l’expression de « sang ». Sohrab – comme tant d’autres malheureusement – est un apatride moderne, un homme rejeté par une patrie qui punit farouchement l’art créatif. Privé de toute communication avec l’extérieur, Sohrab est condamné à vivre une vie de clandestin musical, armé d’un matériel précaire (le logiciel Reason 3, un sampler et de basiques contrôleurs midi). Mais il n’est nul fardeau plus lourd qui saurait amener l’homme a se révolter. Sohrab a donc fui, son album sous le bras, en quête d’un avenir meilleur. Exilé aujourd’hui à Berlin, celui-ci a son avenir dans les mains des autorités allemandes, qui décideront que faire de sa demande d’asile politique. Ayant tout perdu sinon son album et son matériel, Sohrab s’est fait recruter par la plus grande écurie en matière de textures sonores, l’intouchable Touch Music. L’histoire est parfois bien faite. A Hidden Place résonne comme un produit de l’isolement autant qu’une réaction à celui-ci. Les six titres de ce LP travaillent une ambient crue, vive et follement paradoxale. Les ambiances optimistes dégringolent au fil de l’album, s’essoufflent contre l’avancée d’un nuage noir. A Hidden Place est l’histoire d’une lutte permanente, à l’issue toujours incertaine : chaque moment de bonheur sous-entend l’anxiété au bout du tournant. La fausse tranquillité des plages ambient – qu’on pourrait attribuer tant à Biosphere ou The Field qu’à BJ Nilsen – sont bardées d’incongruités sonores, de ruptures sonnant comme des bugs téléphoniques dus au manque de réseau. Le message, d’une importance cruciale, se voit ponctuellement entaché de hiatus, comme si rien ne pouvait être facile pour un homme sans racine. On trouvera dispersé là quelques rares enregistrements de paysages, quelques poignantes incantations vocales, le tout évoquant une appartenance qui n’est plus. Sohrab, 26-årig musiker från Teheran, var tidigare med i ett punkband. Senast de spelade live stoppade polisen konserten. Nyligen lämnade han hemlandet och har sökt politisk asyl i Tyskland. Innan jul läste jag att han befann sig i en flyktingförläggning utanför Berlin. Sohrabs solodebut reser i drone/ambient-landskap, med fältinspelningar (dialog från en Tarkovskijfilm, naturljud, sång på farsi) som stärker den konfliktpräglade musiken, som pendlar mellan dröm och skarp verklighet. Shirin Neshats film Women without men är en parallell. Musikaliskt ligger skivbolagskamraterna BJ Nilsen och Fennesz nära. Sohrab is a tragic figure in Persian mythology. The Shahnameh (Tale of Kings) tells how he was fathered by a Persian champion and the princess of a neighboring nation and then faced his father in battle. Father grievously injures son, king of Persia withholds medical intervention to keep father under his thumb, son dies; in light of the brutality visited upon protesters of the outcome of the June 2009 Iranian elections, you can see how the story has legs. It’s also worth nothing that the literal meaning of the word “sohrab” is “red water” and connotes blood. When a young Iranian guy names himself Sohrab, he’s saying something. The artist known as Sohrab used to play in a punk band with his brother, but the authorities shut them down before they could finish a gig, and since then, he’s confined himself to making music at home with a sampler. A Hidden Place, his first release, sounds very much like a product of its instrument, and fits right in with other Touch releases. With its sweeps of slightly grainy synthetic strings and long loops of squishy bumps that could be boats bumping together, the first track “Susanna” sounds like it could have been lifted from a pre-Autour de la Lune Biosphere record. Given the album’s name and the artist’s history, I imagine Sohrab hiding out from a country and a life he can’t stand by donning headphones, surfing the web, and finding sounds that take him away. Anxiety pervades this music; on “Somebody,” the sounds of roosters crowing and a woman’s wordless singing gnaw at the clanking sounds of household activity, and “Himmel Über Teheran” opens with the ominous toll of a bell before widening out into a layers of bright, pulsing tones. Human voices and chickens return on the title track, overwhelming the jet-like sounds with lusty hollers and heedless clucking; they sound like something you want to avoid, and the music that follows feels ever more interiorized, as though Sohrab is burrowing deep into the sounds of his machines and his own private thoughts. Iran, one of the most restrictive countries in the world today is at the same time the birthplace of an immense traditional culture. Yet, alongside the traditional culture, Western forms of artistic expression has always been present. If your knowledge of Iran is limited with diaspora artists such as Deep Dish, or Ata Ebtekar, Sohrab, a 27 year old composer from Tehran can give you insight on a new generation of electronic composers that still live in Iran. His latest LP, A Hidden Place, released by UK’s esteemed Touch, creates sparse sonic landscapes through a wealth of field recordings, drones, deep noises and clicks. Being unfortunately isolated from local and international artists, Sohrab has managed to detail the draining zeitgeist in Iran. His first and only gig was in Berlin’s Berghain with Fennesz, Hildur Gudnadottir, so we’re thankful to Touch with this find. Don’t miss this one if you want to peek through the veil that is Iran. Sohrab est iranien, il est né à Téhéran, il a 26 ans. Il y a quelques années il créait un groupe punk avec son frère et un ami, les Fat Rats. Le dernier concert qu’ils ont donné a été interrompu par la police. Depuis, Sohrab se cache, il vit dans l’isolement et compose seul à partir de quelques machines. Un contexte qui a son importance quand on sort un album intitulé A Hidden Place et que cette musique, à forte dominante ambient, nous évoque régulièrement le terme “isolationism”, aussi bien pour son sens politique qu’en tant que genre musical. La musique de Sohrab est avant tout électronique, généralement composée d’un assemblage de nappes feutrées, un son que l’on trouvera proche de Biosphere sur Susanna qui ouvre l’album. Quelques claquements donnent un léger tempo, des basses flottent sur un enregistrement aquatique, et le tout nous évoque un certain dub électro, cotonneux, envoûtant. Sur Somebody, tout semble lointain. La musique elle-même, comme filtrée, nous apparaît distante, comme le vague souvenir d’un pays éloigné, tandis qu’un chant semble être capté dans les environs, une femme travaillant dans un champ, un coq au loin. La première face se termine avec Pedagogicheskaya Poema dans un mélange de bouillonnement issu d’un traitement numérique, et de mélodie limpide, lumineuse. La face B est construite selon un schéma similaire. Une ambient feutrée avec un rythme créé cette fois par une tonalité oscillante, issue de la résonance de cloches (Himmel Über Tehran), puis une deuxième partie qui gagne en noirceur avec A Hidden Place, un croisement de souffles et textures granuleuses, et là encore des voix que l’on a du mal à cerner : cri de panique, alerte ou chant tribal au milieu d’une atmosphère étouffante et désertique. On termine avec les 6mn de Zarrin, nappes oscillantes que l’on croirait issues d’une guitare, quelques grésillements, des pulsations lumineuses et enfin l’impression de retrouver une sensation d’apaisement. 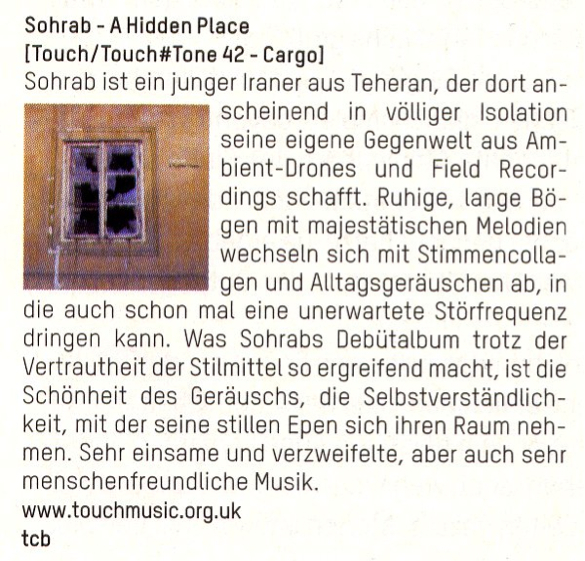 I usually try to stay on top of most drone/ambient releases, so I’m not sure how I completely missed Sohrab’s “A Hidden Place” when it came out. I recently got my hands on a copy and was totally captivated, prompting the writeup. Sohrab is a young man (26 years old) from Tehran, this is his debut full-length on Touch. Dense, desperate drones are moved along by an incredibly subtle techno influence, fueling an under-riding groove. It’s a heavy bit of melancholy, though the buried energy keeps it from becoming too whitewashed. A promising debut for sure, eyes will be kept on him. Tee trinkt er mit Bedacht, an der Zigarette zieht er hastig. Sohrab, sein Name kann “rotes Wasser” oder auch “Blut” bedeuten, trägt eine Kapuzenjacke, als wollte er sich in das Kleidungsstück zurückziehen. Im Oktober 2010 spielte er im Berliner Berghain als letzter Künstler auf der Labelnacht seiner britischen Plattenfirma Touch und blickte während des Auftritts ständig in den Laptop; Blickkontakt mit dem Publikum vermied er. Das war weder Autismus noch Künstlerpose geschuldet: Sohrab, geboren 1984 in Teheran, ist Kriegskind und Flüchtling. Die Fat Rats spielten in zwei Jahren gerade eine Handvoll Konzerte vor 10 bis 50 Zuhörern. Das letzte wurde von der Polizei abgebrochen; sie konfiszierte die Instrumente. Die Musiker mussten bezahlen, um sie zerstört zurückzukriegen. Anhören kann man sich ihre Musik trotzdem: Auf der 2004 beim Pariser Label Tian An Men 89 (es ist auf Punk aus Ländern spezialisiert, in denen man ihn nicht vermutet) erschienenen Compilation “1382: The Persian New Waves” beenden sie die A-Seite mit einem Zwei-Minuten-Kracher. Von der Existenz des Albums erfuhr Sohrab aus dem Internet. Er selbst besitzt erst seit wenigen Wochen zwei Kopien. Mit dem nihilistischen Furor des Punk hat die elektronische Musik, die Sohrab seit dem erzwungenen Ende der Fat Rats veröffentlicht, wenig zu tun. 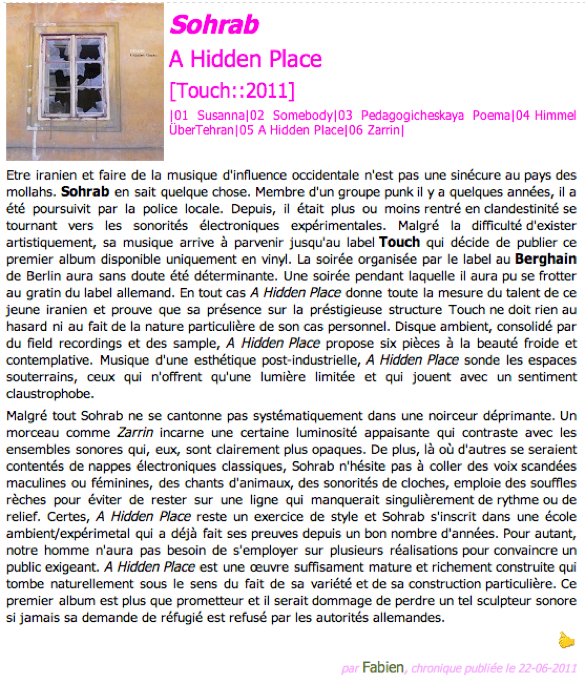 Der Sound seines Ende 2010 erschienen Debütalbums “A Hidden Place” ist der der Isolation, einer stillen Einkehr nach dem Ausbruch. Die Musik klingt schwerelos und ist spiritueller Natur. An einer Stelle sampelt Sohrab Andrei Tarkowskis “Andrej Rubljow”. Er interessiert sich für Russland und ist begeisterter Maxim-Gorki-Leser. Die traurigste Zeit: Sohrab musste Teheran verlassen. Er sei wahnsinnig geworden in seiner Heimatstadt. Seine Entfremdung – er hatte an den Protesten gegen die gefälschten Präsidentschaftswahlen vom Juni 2009 teilgenommen und war inhaftiert worden -, war mehr als eine politische: Er wusste, dass er nicht der Einzige war, der im Abseits alleine vor sich hin wurschtelte, doch war kein Kontakt möglich. Nach seinem Konzert im Berghain beantragte Sohrab in Deutschland Asyl. Hinter ihm liegen mehrere Monate eines zermürbenden Verfahrens. Es hat Spuren hinterlassen: “Ein Gang durch die Straßen zeigt mir, dass ich isoliert bin.” Auftritte sind ihm in Deutschland verwehrt. Zum Komponieren kommt er, obwohl es ihm nicht leicht fällt. Er überlegt, sein nächstes Album “Recordings from heim” zu nennen: Er lebte zuerst in einem Auffanglager in Eisenhüttenstadt und ist jetzt in Prenzlau untergebracht. Sein Asylantrag ist in erster Instanz abgelehnt worden. Um die Anwaltskosten des laufenden Verfahrens bezahlen zu können, hat er unlängst einen auf der Touch-Website verfügbaren kurzen Track veröffentlicht: “Shouting at Dictators” schlägt rauere Töne an. Sohrab verwendet Samples nächtlicher Demonstrationen in Teheran. Die Menge ruft “Allah u Akbar” (“Gott ist groß””) und “Mag bar diktator” (“Tod dem Diktator”), die Stimmung ist bedrohlich und gespenstisch.